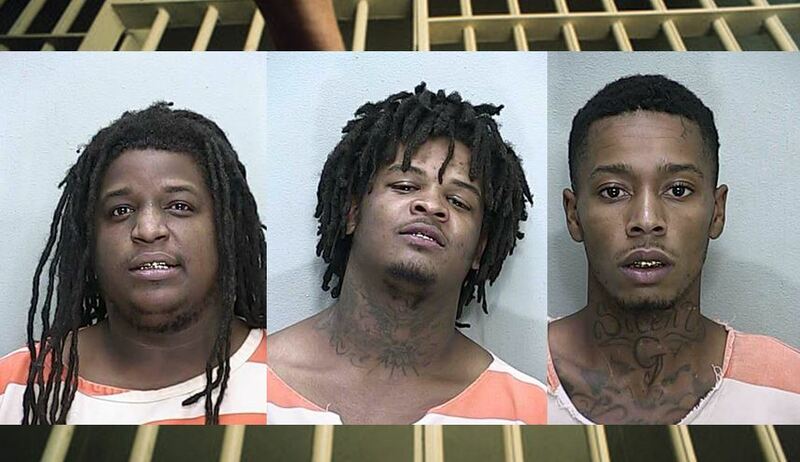 Ocala, Florida — Three men were arrested at Ocala Place Apartments after a caller reported seeing the men walking to a grey pickup truck while carrying multiple firearms. When police arrived, they saw Vincent Williams Jr., 28, Larry Williams, 25, and Kerrian Dukes, 22, standing next to a grey Toyota Tundra. According to reports, when police approached the truck they discovered two juveniles — ages five and seven –in the back seat. The juveniles were later released to their mother. Upon searching the vehicle, police found a Glock .45, a Kel-Tec .380, and an AR-15. Additionally, police found several baggies of methamphetamine and a baggie of marijuana. Vincent stated that they had gone to the location to purchase the firearms, but was interrupted by police. He said that a man threw the weapons in his truck and ran off when police pulled up and then crawled away from the area. Vincent told police that he had no idea how the drugs came to be in his truck. Vincent was arrested and charged with Possession of Methamphetamine with the Intent to Sell, Possession of Marijuana, and Possession of a Firearm During the Commission of a Felony. Larry was arrested and charged with Possession of Marijuana and Possession of Ammunition by a Convicted Felon and Violation of Probation (x7). Kerrian was arrested and charged with Possession of a Firearm by a Convicted Felon. The Department of Children and Families was notified.